MONDAYS, TUESDAYS, THURSDAYS @ 7:30 P.M. The Kickstart Program is Mi5's unique approach to teach you the fundamentals of fitness, nutrition, and healthy lifestyle habits. In our program, you'll gain the skills you need to have success with your fitness and a sustainable approach to nutrition. Plus, you'll gain a whole new community of friends. 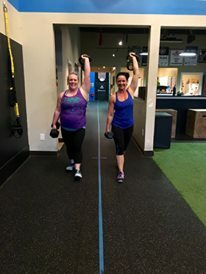 This program blends proven fitness concepts with a community of fun, supportive, and positive coaches and members. Each week is designed to push your limits, but also to show you that intensity is individual, not a one-size-fits-all. Each work out is customized to the participants' ability levels, and every participant will see results.